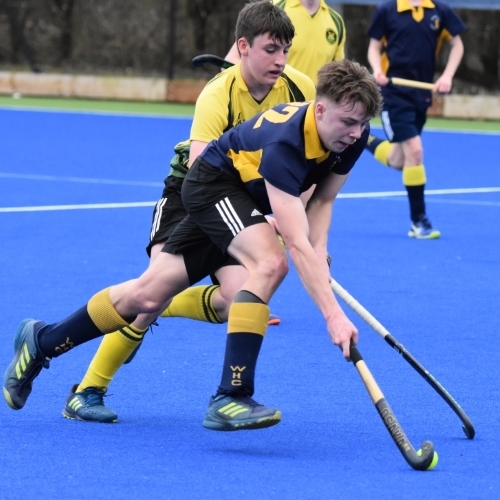 Sunday March 11th, Mothers Day, marked for us with a terrific performance by our U18 Boys eventually winning on penalty flicks after a tense 3-3 draw at full time in this England Hockey quarter final match. Despite their 2.5hr journey Norwich started the quicker pressing Warwick back for the first 10 mins. Some resolute defense by Warwick's defensive line of Dan Murray, Nigel Perry-Ogden, Jack Bennett and Archie Gale kept Norwich's skillful forwards out until a lose ball was scrambled past Adam Mander as he dived to save in goal. This spurred Warwick into a more focused playing style with Warwick's mid-field of George Holding, Dan Kingman, Ben Cooper and Oli Hobbs gaining control for good spells , often setting up attacking waves for Warwick's rolling forward line of Matt Leatherdale, Andrew Dellow, Freddie Herd and Henry Curran. Warwick's efforts were rewarded with a slick move down the right side involving Dan, George, Archie & Andrew setting up Oli Hobbs to finish. The game was fast paced with sweeping moves up and across the pitch. Warwick lost Dan Kingman to an ankle injury, so Henry and Tom English took a more significant role in midfield and defence. Another skillful Warwick attack down the left channel with Ben, Oli and Matt linking up lead to a chance for Andrew who skillfully lifted the ball over the diving keeper only to be fouled giving Warwick a penalty flick. The umpires deemed the foul to warrant a yellow card for the Norwich keeper so another player had to step in but Oli easily dispatched the flick to make it 2-1 Warwick as we went into halftime. After the break Warwick pressed hard again with the advantage of the Norwich keeper being off the pitch, earning a short corner that was cleverly lifted home by Oli Hobbs earning him his hat-trick. Norwich fought back hard and with pace and skill forcing desperate tackles from Warwick, several seen by the umpires as being illegal and started to show green and yellow cards. Norwich took advantage of the numbers and deservedly scored one and then a second to make it a tense last 10 mins end to end with both sides getting another chance. When the whistle went a 3-3 draw felt a fair reflection of a competitive and highly skillful contest, and so to penalty flicks. Warwick won the toss and elected to go second. Adam Mander in goal for Warwick made an outstanding save of the first flick. Matt stepped up to take Warwick's first. aiming low to the corner, the Norwich keeper also made a terrific save. Norwich scored than Ben stepped up to score spectacularly off the underside of the bar. Norwich scored despite Adam getting a finger to the ball, up stepped Oli, their keeper guessed the right way but there was enough power on the flick for the deflection to continue on into the net. Norwich then missed and Henry stepped up making a superb low flick right into the corner. Norwich leveled the score so it all came down to the last flick with Dan Murray who confidently stepped up and drilled the ball low into the net. A fine match and a great achievement but this very talented Warwick U18 side. Semi-finals here we come on 8th April. We have been drawn at home, Warwick School astro, 14:00 start. Come and support our lads!